This is essentially a lost album from Rory Gallagher. Well, actually, it’s kind of two lost albums. 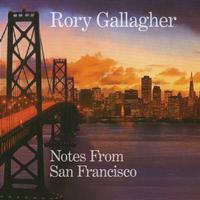 The first disc is a collection of studio recordings Gallagher did in San Francisco in 1977. The songs were never released before. The second disc is a live concert recording from the same time period and the same city. All in all, this is a strong collection that should please all fans of Rory Gallagher. Piano leads off here in a real bluesy introduction. Then they power out into a more rock arrangement with some boogie woogie piano built into it. This is very much an energized rock tune that’s quite catchy. We get some seriously involved jamming later on this number. The guitar is more fundamentally involved in the power of this number. There is some Thin Lizzy like bluesy hard rock here and we get a killer instrumental section later that’s got bits of jam band and even some jazz built into it. We get more of a traditional blues rock arrangement here, but there’s jazz in the mix, too. All in all, it’s a tasty rocker on a disc that’s full of them. There’s a cool organ solo in the midst of this. The guitar soloing here is particularly strong. Considering Gallagher’s considerable skill in that department, that says a lot. Here we get a much slower song that’s more classic rock than blues. It’s turned out to a cool grind later in the piece and we get some harmonica in the mix, too. As the extended jam continues there’s a violin solo, too. A mellow and pretty song, this is essentially a power ballad. It’s got a lot of emotional impact and some classic rock groove. Although this has a real classic rock texture to the majority of the number, it works out to some bluesier sounds for the extensive guitar solo section. Here’s a smoking hot blues rocker. There aren’t any huge surprises, but this just works really well. Of course, the guitar soloing is top-notch. Both the keyboards and the guitar get chances to shine here. More of a straight ahead rocking sound is heard here. This really makes me think of Thin Lizzy quite a bit. We get treated to some awesome slide guitar work and there are some sounds later that have a real Mexican element to them. A saxophone makes its presence known on this killer tune, too. Starting off with more of a full classic rock sound, this works to more bluesy jamming. I can hear Thin Lizzy again here and this is a dramatic and powerful rocker with a lot of blues built into the mix. As the parenthetical suggests, this is an alternate version of the earlier track. While I like this version, too, I think I prefer that one. Still, this is a great track either way. A bluesy rocker, this is riffy driven and very cool. The guitar solo section moves this out into fusion-like territory. A cool bluesy scream is heard on the opening and the riff that drives this is just plain classic. This is arguably the strongest rocker of the whole set. It makes you wonder why this was a bonus track. It’s a real scorcher with some of the finest guitar soloing I’ve heard in a while. It just doesn’t get much better in terms of riff driven hard rock than this. Here we get a typical Rory Gallagher bluesy rocker. Of course, what’s typical for Gallagher would be incredible for a lot of other artists. That’s how great this man was. This has a more straightforward element than the first live cut did. Still, it’s a smoking hot Gallagher rocker that works very well. It includes some particularly fiery guitar soloing, too. Opening in a motif that makes me think of Robin Trower, this stomps into some more traditional blues from there. A real hard rocking blues guitar opens this. The guitar holds it alone for a time, but then the rest of the band jump into the fray. It’s another strong blues rocker in that Rory Gallagher tradition. It has some more killer slide guitar. This runs straight into the next number. They pick up the tempo, but the general musical concept is pretty well unchanged. This rocker is another strong one on a disc that’s full of potent tunes. A raw, hard rocking sound permeates this one. It’s another killer tune. The guitar solo section on this is particularly powerful and effective. This bluesy rocker feels like something Stevie Ray Vaughn might have done. It’s another winner, but everything here succeeds. More classic Rory Gallagher jamming, the guitar soloing really steals the show on this scorcher. The intensity comes down a bit with this, a more traditional blues number. The lack of volume and hard rock power aren’t missed, though, and this is a classy change of pace. It gets an infusion of power as it nears the close, but it’s still more pure blues than it is rock. While the general motif isn’t all that different from the rest of the music here, this one works well, and we’re in no danger of getting bored. Gallagher’s smoking hot guitar solo would guarantee that even if the rest of the song lagged, which it doesn’t. There’s some killer vocals and guitar on the intro to this number. An old school rock and roll groove mixed with the blues creates the main riff here. They take it straight into the next number, which is quite similar. This definitely has shades of Chuck Berry. This thing is just incredibly fiery in terms of all the instrumental work. It might well be the most energized number here. There’s a cool bass solo mid-track here, followed by a drum showcase.